Pati, Central Java - Today, (Friday / August 24 2018) PT Toyota Motor Manufacturing Indonesia (TMMIN) and PT Toyota Astra Motor (TAM) along with Toyota Astra Foundation (YTA) show their commitment and seriousness in developing national education through CSR activities. "Industrial Culture Class Program" which was inaugurated at SMK Tunas Harapan Pati. The program inauguration program planned to be launched nationally, was attended by the Regent of Pati Distric H. Haryanto, SH. MM. M.Sc., Director of Vocational Development Dr. Ir. M. Bakrun MM., Center for Secondary and Special Education Control (BP2MK) Region II Pati Santoso SH, MH., Head of Central Java Education Office Drs. Gatot Bambang Hastowo M.Pd, Executive Director of Indonesian Chamber of Commerce and Industry (KADIN) Rahardjo Djamtomo, President Director of PT TMMIN Warih Andang Tj., PT TMMIN Administration, Corporate & External Affairs Director Bob Azam, and PT TAM Director Darmawan Widjaja. The Toyota Indonesia Industrial Culture Class Program is the first initiative carried out to be part of an effort to enrich the skills of young generation of SMK graduates so that they are more easily blend-in in the business world. This background that build the Industrial Culture class program that will further sharpen the character building and industry culture of these vocational graduates. In the "Industrial Culture Class Program" participants receive knowledge of industrial culture that expected to meet the criteria of job skills that emphasize the mentality of working systematically, efficiently, and effectively to build a 'Ready' graduates. Which means students who join the Industrial Culture Class are expected to apply certain technical skills specific to the type of job that will be handled in the industrial world. 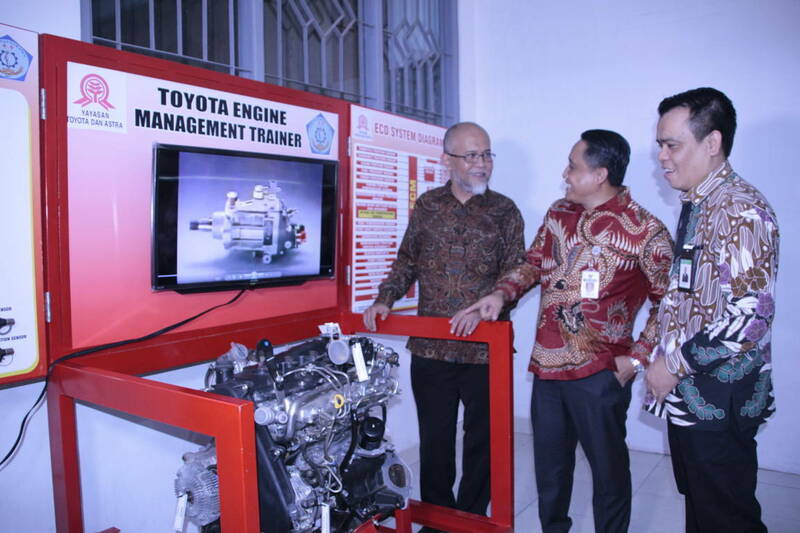 "In line with Toyota Indonesia's vision to contribute to national education, we hope that this "Industrial Culture Class Program" can help improve the student’s skills and abilities. So that it will increase the quality rate of SMK graduates who can meet the needs of skilled workers in the automotive industry that continues to grow," said Darmawan Widjaja, Director of Toyota-Astra Motor, today, on the same occasion. The plantation of the industrial culture class mentality will be carried out by integrating consistently the insights of industrial culture which include the principles of 5R (Concise, Neat, Clean, Care, Diligent), Work Safety (Suspiciously Dangerous), Group Cooperation, Orientation on the quality of the process and work , 'Kaizen' (continuous improvement/improvement), and systematic problem solving. As the Premiere Program, Toyota Indonesia through YTA will conduct trials on 15 Vocational Schools in West Java, Central Java and East Java. This selection is based on the commitment shown by the Vocational School in improving the quality of learning in each school. The trial of the Industrial Culture Class will be conducted in 2 years, starting in the 2018/2019 school year in class XI and starting in the 2019/2020 school year onwards in class XII. The first thing that was done was the basics training 5R, the basics of the Toyota Production System and work safety for all principals and the teacher’s officials to then be socialized to their students. The class will be carried out using the official Industrial Culture class curriculum which is a combination of the current national curriculum and industry culture content. Industrial Culture Classes can be applied in various departments in the school. Curriculum and insight into industrial culture will be taught directly by 68 teachers from 15 Vocational Schools that YTA has trained intensively in the period of January-June 2018. Evaluation will be conducted periodically by the YTA Evaluation Team to measure the effectiveness of learning, especially lesson of the industry culture content in producing student behavior changes that become a benchmark. Industrial culture classes are carried out to increase the chances of vocational graduates to meet the needs of human resources in the industry through ownership of industry characters, especially having perseverance and mentality of thinking like an engineer who puts forward the analysis. "The formed of the habit of working systematically, efficiently, and effectively becomes the main objective of the Industrial Culture Class program. The mentality that is built among SMK graduates is expected to make this generation able to be selected properly in real employment. Industrial Culture Class is present to enrich the insight and character of the industry for HR so that they are ready to become skilled workers," said PT TMMIN Director of Administration, Corporate & External Affairs Bob Azam." For almost 5 decades (48 years) in Indonesia, Toyota has tried to provide full participation and support for the development of Indonesia's industrial progress. One of them is through improving the quality and qualifications of vocational school graduates to meet the high demand of the industrial world. All of these commitments are summarized in the spirit of Toyota Berbagi (Together Building Indonesia) which consists of three pillars, which are product and technology development, automotive industry development and corporate social responsibility.